It is getting hot in Tokyo. Shinji has stocked the freezer with Gari Gari-kun. 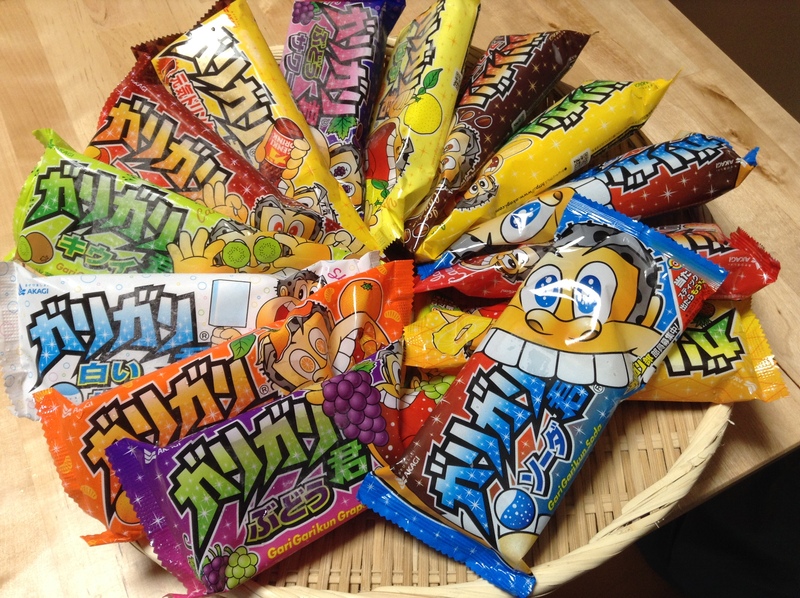 A popular popsicle that is sold at convenient stores and supermarket. The price of Gari Gari-kun went up last year and the company apologized to fans across Japan in this great commercial. Gari Gari is the sound of biting into something hard and crunchy (or ice cold). Kun is what we use when calling out to small boys. Gari Gari-kun is a fun name for this product that comes in many different flavors like grape, kiwi, or watermelon. You can see their flavors here (in Japanese). Pick it up when you’re hot and need to cool down. If there is writing on the popsicle stick, that means you get a second one for free. Bring the popsicle stick to any retail store and ask them if they’ll redeem it for you.